The Walking Dead: Zombie or Ghoul? ﻿﻿Film-makers and the popular culture need to get their stories straight. Hungry dead that shuffle after the living (to eat them) are not zombies, they're ghouls. No wait, maybe zombies only eat the living and ghouls only eat folks that are already dead? What about those mindless dead brought back by a voodoo guy with the magic zombie powder - are those the *real* zombies? And which ones are in D&D? Deep breath. Let's take a moment, try to wade through the folklore and see how this could all be straightened out, and hopefully answer the question - what exactly is a ghoul? The folklore origins are kind of scarce. Ghouls show up in One Thousand and One Nights - mostly as a bunch of over-sized mountain (humanoids) that like to eat people - seemed more like hillbilly ogres to me, than ghouls. Lovecraft has ghouls. Lovecraft's ghouls live underground, sneak into graveyards, and chew on corpses. There's even a process to turn yourself into a ghoul, through cannibalism/necrophagy and a ritual (like Pickman!). Alright, now we're getting somewhere horrible. Except the ghouls speak in meep-meep-meeps - what kind of monster "meeps"? - and they go all commando with Randolph Carter and assault the Castle of the Old Ones in The Dream-Quest of Unknown Khadath; teaming up with meeping ghouls to go storm the castle kind of diminished some of the horror for me. Could popular culture come to the rescue? I Am Legend is the first zombie apocalypse story, except the monsters aren't zombies, they're vampires, but they shuffle around and eat people, like ghouls. I loved The Last Man on Earth version. In the 2007 remake, the monsters were like ghoul-vampire hybrids (they hungered for flesh like ghouls, but had the UV and garlic allergies of vampires). Night of the Living Dead called its horde of monsters ghouls. They ate (living) people. George Romero didn't think of his creatures as zombies; to him, they were ghouls. Now we're really getting somewhere. Could the D&D ghoul be based on Night of the Living Dead? Let's see, what did Gary have to say about it? "When I devised the ghoul for the D&D game it was most assuredly with non-living energization, that is undead status, that enabled these creatures to exist and hunger for the flesh of dead humans and their ilk. The principal motivation for classifying them as undead was to have a progressive level of such monsters--skeletons, zombies, ghouls, etc. IMO, merely eating human flesh is quite insufficient to alter one to become a ghoul. Otherwise, many a remote tribe of savage aborigines would be ghouls, not humans. The negative energy of the ghoul is the reason for its paralyzing ability. Elves, having great positive energy, are thus immune to the effect." What? What did he just say? I think my head exploded when I read that "Elves have such great positive energy". And the ghoul wasn't thought about any deeper than filling a slot between Zombie and Wight on the Turn Undead chart? Bah. Third Edition of D&D puts the cannibal influence back into the origin. It also gives a little nod to the zombie apocalypse genre, introducing Ghoul Fever as a disease. Beedo rubs his hands together, now we're getting somewhere again. Nary a mention of Positive Energy or Negative Planes or any new age hooey, either. Smarter folks than me say the ghoul-elf paralysis thing goes back to Chainmail - ghoul units paralyzed enemy units with fear, elves were made immune arbitrarily due to unit costing and game balance, and we've been rationalizing it in the RPG ever since. I had considered reclassifying the undead into three types - animated zombies, plague zombies, and ghouls. Animated zombies would be the classic voodoo style - can't cross a line of salt and all that. Animate Dead would generate the voodoo-style zombies. 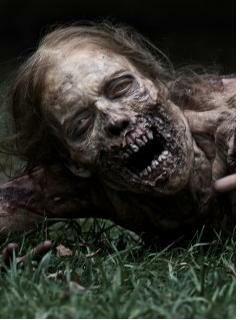 Plague Zombies would be the infectious zombies that have become such a part of popular culture. And ghouls would be… well, not much of a difference between how plague zombies would act and ghouls, is there? (Except ghouls have the negative energy aura paralysis thing). Henceforth, ghouls will be the cannibal undead of my game. Cannibalism will be one of the great evils encouraged by demons and the unclean spirits of the Abyss - especially Orcus. Cannibalism curses those that practice it with ghouldom after death, and the risk of possession by demons while alive - stories of the wendigo attest to such monstrous transformations. The touch of a ghoul is a supernatural affliction that attacks the soul, temporarily paralyzing the victim and transforming the victim into a ghoul after death through the ghoul curse. (Since elves have no souls, that's why they're unaffected. Soulless elves makes me laugh). After being bitten by a ghoul, make a saving throw vs death; failure means the character is infected with the curse and will begin the transformation into a mindless, but cunning, ghoul. Elves are also immune to Ghoul Sickness. (They still have no souls). Ghoul Sickness requires a new saving throw every 2 hours; each time a save is failed, the victim loses 3 wisdom points. When wisdom is reduced to zero, the victim dies and rises as a ghoul. There is no normal recovery from Ghoul Sickness; it is a supernatural curse that corrupts the character's soul with obscene hungers. As the character's wisdom drops, they'll find themselves drawn to the taste of blood and raw meat, and will begin noticing that everyone around them is starting to look like a meal. Ghoul Sickness can be cured with Remove Curse; receiving a Bless or consuming Holy Water will halt the disease (automatically make the next Save). Once cured, lost Wisdom will regain normally. Of course, the pernicious nature of the curse is such that if a character willingly engages in cannibalism, the spread of the disease halts for the day, and the character immediately regains all of their lost wisdom. At that point, it would be best to make a new character, anyway. But way to embrace the horror, dude. Say hi to Orcus for me. *I suppose if I'm going to post blog-ish stuff that could be used in other people's games, I'll have to learn the whole OGL "designate as open game content" thing. Duly noted. Sounds cool. That sounds like a good idea. In the City, ghouls aren't undead, but a subrace of humans which are obligate cannibals, lest they suffer a debilitating neurologic disease. They also like musical theater. Weren't they a variant strain of humanity created through biochemical malfeasance, that soon began to experience genetic drift and splinter of into another species? A biological form of vampire, as it were, with the mutation causing the 'traditional vampire' weaknesses for the most part and psychsomatic reaction providing the rest of the symptoms, due to the legends of such creatures existing before the recent cataclysm? Most people seem to remember 'The Omega Man' starring Charlton Heston. Which was very cool, Christ symbology or not. Moses(Or Will Penny) vs. Vampires. Awesome! Then there's the Nehwon ghouls: humanoids with translucent skin and visible bones! They consider humans 'mud men' and purify them by devouring their flesh, turning them into 'crystal' like themselves... The ladies sometimes become the ghoulfriends(see what I did there?) of human males. I.E. Kreeshkra and Fahrd in The Swords of Lankhmar. Well, they are supposed to be extremely hard to kill, no matter what source you consult. Which made it all the more puzzling that AD&D assigned them a CON penalty, which Tunnels and Trolls eventually adopted, as well as other, later games. It mostly seems to be fading away now, though. Of course, your Elves could be 'different' or something, and therefore warrant the penalty somehow. YMMV. See humanoids, Fairies, Dragons, Demons/Devils(very similar[later Daemons/Slaad, etc...]), Humanoids, Golems, Giants(including Giant Animals), Gloopy Stuff, Undead(of course), and so on... Variance of the norms was the order of the day! And yet they don't care! They spit derision at those who aren't lucky enough to have 'spirits'! (maybe that ties in with Positive Energy Thingy. I dunno.) Wow, Spirit/Soul dichotomy, how Medieval Theology(mediated through Tolkien) of you, D&D. If Pelor was a donkey, would the crops still grow? Great rundown of the various form of ghoul out there and its (rather disturbing)application to the campaign! In my animistic setting, "ghouls" are akin to the Wendigo, cannibalistic spirits that can posses humans and turn them into savage cannibalism. Interesting topic. I've thought on and off about the undead types in the game. I usually treat ghouls as a canibalistic undead possessed of an animal cunning, whereas zombies are more mindless automatons that simply respond to stimulus. The way I play it, a zombie or skeleton would not have any instinct for self preservation, while a ghoul does possess some measure of self awareness and a basic survival instinct. Yep, it'd be easy to just say plague-zombies = ghouls, if not for the paralyzing touch, so I needed to think it through and put in a more supernatural rationalization; the negative and positive energy stuff in AD&D always left me cold. I played out a small War Machine campaign uses the forces of Sterich so I could get a sense on what would happen when the undead crashed into civilization - funny stuff. So it got me thinking about 'rising from the dead' and whether ghouls should be contagious. The idea of someone (an NPC villain) inflicted with the ghoul curse, but keeping it under-wraps by feeding their ghoul side, makes me smile.